The first prefab unit will be removed from Dovedale Village on 25 October by Laing Properties. The unit will leave the site guided by pilot vehicles between 10.00pm – 11.00pm. Low levels of noise are expected. Please take care if you are in the area. Further updates will be provided as more units are scheduled for removal. The north entrance of Ernest Rutherford will be closed from Thursday 30 August to allow for concrete repairs to take place in the forecourt. This will result in the bridge from the Civil/Mechanical and Engineering Core entrance being closed also. Pedestrians will be able to use the entrance from the Engineering Core / Link building and follow the path between Ernest Rutherford and the Beatrice Tinsley construction site and enter Ernest Rutherford from the side entrance. This work will be completed in time for the start of term four and access between the buildings will return to normal. All other entrances to Ernest Rutherford will remain open. 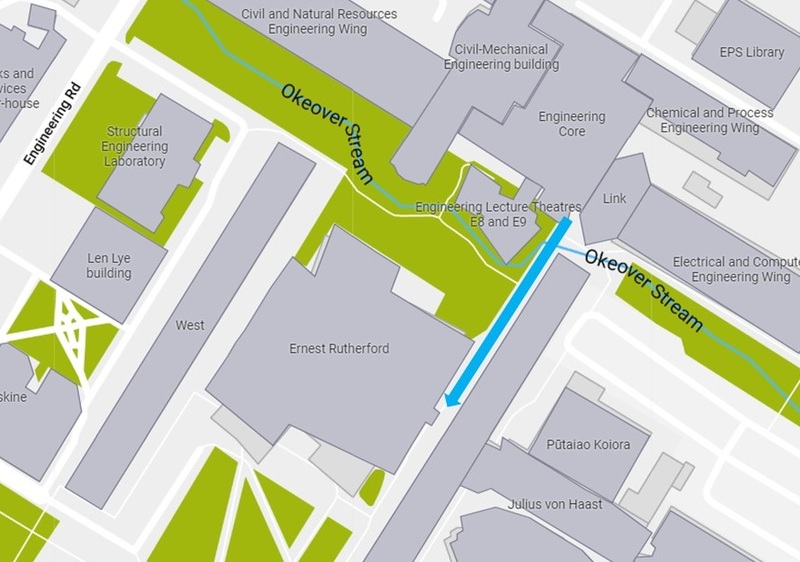 Follow the blue arrow for access between Ernest Rutherford and the Engineering Core. This weekend (18 – 19 August) construction will start on a protected walkway between the Ernest Rutherford building and Beatrice Tinsley construction site. This is in preparation for construction of the elevated link bridges that will join the two buildings. Pedestrian access will remain at all times between Ernest Rutherford and the Beatrice Tinsley buildings – please be considerate of others and take care during busy times, as the passage could become congested. Alternatively, walk through the atrium of Ernest Rutherford. All are invited to attend an on-campus screening of the documentary, Obrero next Monday, 6 August. The largely untold story of the thousands of migrant workers who came to Christchurch from the Philippines following the earthquakes, Obrero details the Filipino workers’ involvement in construction and related industries to help rebuild the city, including the UC campus. The workers talk about their dreams, their lives in Aotearoa New Zealand and the contribution they’ve made to our city. Director Norman Zafra will be available for a Q&A directly following the screening. Zafra is a Filipino documentary maker, currently completing his doctoral studies at Auckland University. 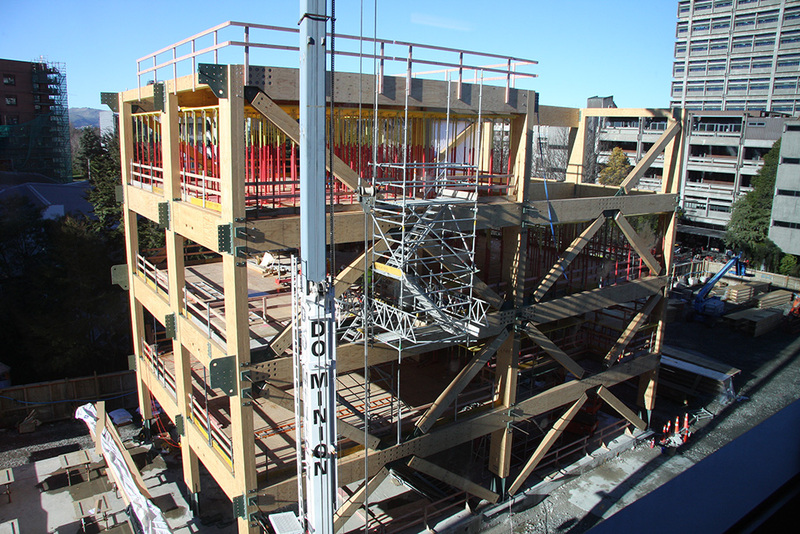 Four-storey timber frames were lifted into place on the Beatrice Tinsley building site during the mid-year break. Scheduled to be completed in 2019, the Beatrice Tinsley building will house College of Science | Te Rāngai Pūtaiao staff and postgraduate students. The building will be a central part of UC’s Science precinct, connecting into both the Ernest Rutherford and Biology buildings. 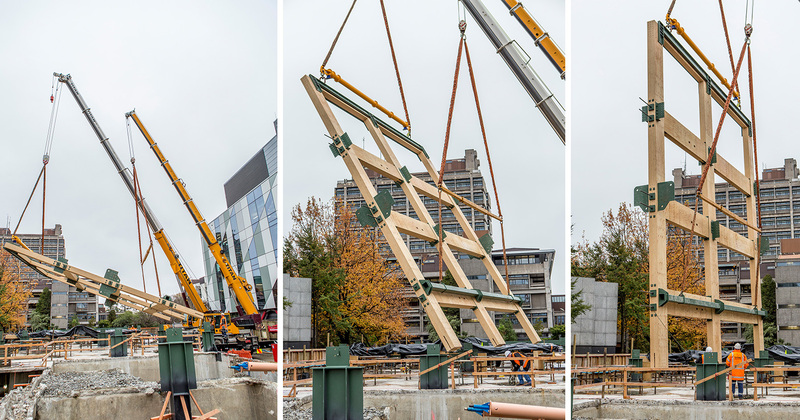 The building design, which pushes the boundaries of multi-storey timber-framed construction in Aotearoa New Zealand, was driven and developed by a team from UC, BECA and architects Jasmax. It uses laminated veneer lumber, or LVL, which has incredible strength and incorporates timber technology that UC researchers developed and are teaching UC Engineering students to use. 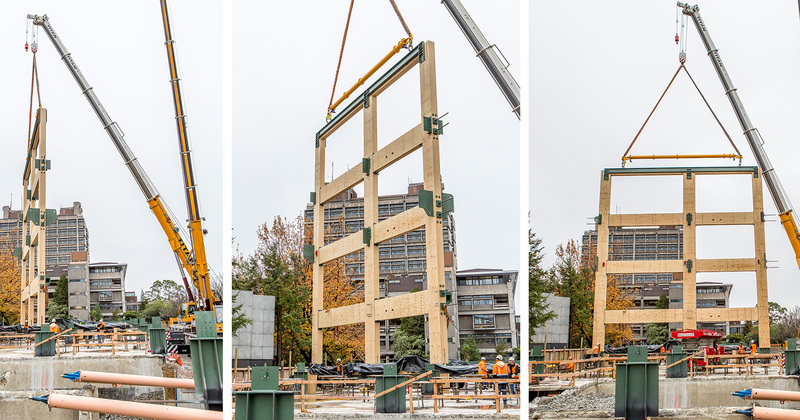 Below: The first timber frames were lifted in to place on the Beatrice Tinsley site during the mid-year break. Below: The Beatrice Tinsley building is starting to take shape.